Fluorescence provides a wonderful gateway to science in general and neuroscience in particular. Visual and easy to explain, it also contains a certain mystique: Why does blue light coming from the light source result in green light coming from the object? Why do only some things “light up” while others remain hidden in the dark? Questions like these open opportunities for discussing the physics of light as well as chemistry and biology. Using NIGHTSEA's special BlueStar flashlight and goggles to investigate fruit fly larvae. (L) A simple bench top experiment. (a) Larvae viewed with regular white light (b) The BlueStar reveals that not all larvae are the same. Using NIGHTSEA's special BlueStar flashlight and goggles to investigate fruit fly larvae. (L) A simple bench top experiment. (a) Larvae viewed with regular white light. (b) The BlueStar reveals that not all larvae are the same. 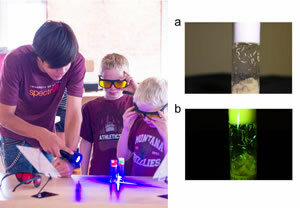 UM Neuroscience researcher, Sarah Certel, and the BrainZone staff have designed and implemented fluorescence demonstrations for students of all ages. A simple bench top experiment reveals a hidden world of fluorescence to kids too young to see through a microscope. Slow moving but active fruit fly (Drosophila) larvae make a great test subject. All it takes is NIGHTSEA’s “magic” BlueStar flashlight to activate the fluorescence and the matching “cool” goggles to act as barrier filters to block out ambient light to see that there is something special going on in what appeared to be a random population of wiggly critters. As children mature, their eyes are able to adjust to looking through the binoculars on a microscope and fluorescence experiments grow to keep pace. Using the NIGHTSEA Stereo Microscope Fluorescence Adapter, any stereo microscope now can be fitted for fluorescence. Using the Stereo Microscope Fluorescence Adapter moves the study of fruit fly larvae to the next level. The three panels on the right illustrate selective use of GFP to highlight. (a) the actin filaments which are pervasive through the larvae. (b) the peripheral and central nervous system. (c) the salivary glands and cells that will develop into the eyes. As shown in the figure, the Stereo Microscope Fluorescence Adapter consists of an easy-to-use LED light source mounted on a goose neck, a barrier filter magnetically mounted beneath the objectives, and a light shield. Blue excitation was chosen for this experiment to best illuminate GFP, however the Stereo Microscope Fluorescence Adapter also comes equipped for violet, cyan, and green excitation, as well as a white light illuminator. At spectrUM, exciting, interactive science isn’t just reserved for their UM campus or downtown Missoula science centers. The “Montana spectrUM Science Experience” (MosSE) travels. To date, MosSE has worked with over 27 schools in half of Montana’s counties and all of the Native American reservations. Because they are robust and easy-to-pack, both the BlueStar kits and the Stereo Microscope Fluorescence Adapter make taking science on the road easy. According to Director Holly Truitt, the kids love having spectrUM visit their cafeterias, gyms, and libraries, inspiring Montana’s next generation of scientists, health care providers, engineers, and visionaries. Because of the variety of experiments and compliance with state standards, any school is sure to find an exhibit that can fit into multiple levels of their curriculum.